I had a phone call from Anne one night. She had recently been up from the South Island to Central Hawkes Bay for a family get-together and she was trying to find out some information about her grandfather Charles William Donghi. She had visited "The Pines" while she was up this way because, for a time her grandfather lived there. She wanted to know what we could find out about Charles Donghi and about his time living in "The Pines" (2 Rose Street), and Bob Donghi who lived at "Rose Cottage" (19 Rose Street). I went down to the museum to see if I could look up the residential file to find out the occupants for 2 and 19 Rose Street and found Rosheen is back from holiday and is half way through her research for you. She has added your request for info about the Rose Street addresses to her list and will email it to you. 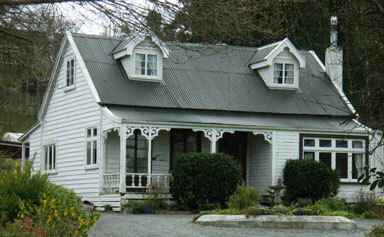 Bo lived in 'Rose Cottage' in Rose Street, home of Cannon Eccles, first vicar of Waipawa. Although called a cottage, it was quite a substantial home. Bob was renowned for being "a bit of a magpie", a real hoarder. On New Year's Day, one very hot summer in late1940's, Bob's house caught fire. Despite the fact it was the first day of the New Year, the brigade promptly answered the call. They had just hooked up to the water and had begun pumping when terrific explosions rocked the area. It was thought old Bob had a few live shells tucked away souvenirs from the war! About this stage, saving the house seemed a secondary concern, as shell fragments peppered the house next door. When the tumult and the shouting died, the house was destroyed save for one room at the front. As a postscript to that story, brother Ernie had the front room moved down to McGreevy Street, onto the property now owned by Mr K Isaacson, and set up house with his sheep dog. His house keeping was a sight to behold; in the corner he utilized as a kitchen grew two piles, one of empty food tins, the other egg shells. As the months turned into years, so the piles grew. This form of housekeeping must have been a family trait, as on visiting Bob, many years later in his rebuilt house, what should be piled up on the end of the table and under it a mountain of empty tins! Not withstanding their housekeeping habits, these brothers were the kindest, most hardworking pair imaginable. I don't know if the museum have sent their information and some of it might be the same as mine (since I got it from them) but I'll send it anyway and you can disregard it if you already have it. I found this newspaper article possibly from the Waipawa Mail (April 1985 - it wasn't dated or properly identified). A cottage which housed the first European-born baby in the Waipawa community could become wood for a fire unless steps are taken to preserve it. The 150-year-old cottage could be Waipawa's oldest house and is in danger of demolition as it stands without occupancy or protection. Concern for the house's preservation was raised recently at the Waipawa District Councils social services committee by Mrs Carol Hudson, Gwavas Station, Tikokino. In a letter to the committee Mrs Hudson outlined the historical value of the cottage which is known as "The Pines". Mrs Hudson also pointed out that a numbered tree, a redwood in the cottage grounds, was also without protection. She said councillors should know of the cottage as it hangs as a painting in the council foyer. "I am sure the people of Waipawa will be grateful to have a little of its past protected," said Mrs Hudson. I have also enclosed a copy of Mr Bryant's residential file - Mr Bryant was the Pharmacist here for years and an historian. He kept very accurate files of nearly every address in Waipawa until he left sometime in the early 1990's . Rosheen might have already sent you this as I told her that you were interested in 2 and 19 Rose Street and suggested she send the info, but the card from Bryant's File was attached to the newspaper articles she gave me yesterday so I've typed it out too. 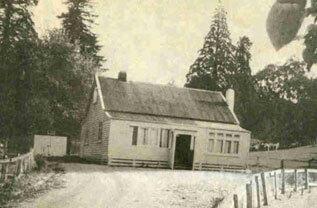 The first house built in Waipawa by Thomas Henry Fitzgerald in 1858. Built of Kauri shipped to Napier, and transported to Waipawa by bullock wagon. The property was surrounded by a hawhorn hedge, part of which is visible today (1990). Large numbers of Pines sheltered the pigeon loft and stables. The next owner was Charles Herman Weber whose son George born 24th October 1861 was the first white child born in Waipawa. * If anyone can help to complete the list of occupants please email me and let me know names and dates. I have been thinking about your idea of finding family information on your web site and I think it could be a very useful tool. In our case, our names of interest in Waipawa are DONGHI and HANCOCK. There are plenty of other associated names, added when their children married and moved to other parts of Hawkes Bay and beyond. We would like anyone who has a link or information about our family. Many thanks for the information you sent, it wasn't repeated by Rosheen from the Museum. Didn't the person who restored the house do a great job? I have worked out from postal directories that Charles Donghi moved into Rose Street between 1939 and 1944 and lived there until he died in 1953. In Margaret Gray's book 'Abbott's Ford' a history of Waipawa, she shows a census of the population of Waipawa in 1867, and this includes my husband's grandfather Walter HANCOCK. It was Walter's daughter Emma who married Guiseppe DONGHI. The street map in the book doesn't show where Walter lived, and I wondered if there was any more to the map which wasn't published. Thanks again for your interest and your help, we really appreciate it. I began reading your historic researches last night and became quite excited. You do a wonderful service for those seekers. Mention of Donghi made me turn back to Grandad/dad's notes I took off the now defunct tape. We asked him the info behind the rest of the Rose street homes. Incidentally Claire took the tapes to see if a Police technician could copy them to good effect. When I mentioned the idea of the cemetery 'Walks', he said Norsewood do them once a month. What enthusiasm! I see how valuable they are as personalising our town’s past. I shall write the Donghi notes here regarding the house that was once Donghi's. A Mrs Taylor, owned it and her boys, Cecil and Eddie were playmates of ES Bibby. She later bought a burned out house of Ingles from Ormondville. This Italian, settler, Mr Donghi, had married a Waipawa girl and they had 17 boys and one girl. They were Seventh day Adventists. Fantastic workers. [Athol Bibby has anecdotes about the work done for him by ?Charlie also an incident about ?Bob and his stash of money that was in his home when it burned down later on. Eric quote My D snr quizzing him after church and offering a an note from a bundle tied inside his trousers if he had learned that days Collect]see Eric’s memoirs page 12 for more comments on their great work on the Bibby farm and mention of Ernie Donghi. Bob, a son lived on in the family home till he died in 1970.He was a character who salvaged stuff also a very kind man. There were four boys who made this their home. One Albert deeply feared conscription. When he was roped in to Army camp he escaped through the hole in the 'closet'[ESB's word for the latrine. ]Albert made his escape from camp and back to his home. The Police heard of this and searched the house and found Albert under the bed. They marched him off to Court. Here an early German settler Petrowski cheered at Albert’s insubordination. As a result Mr P was taken up for sedition and disenfranchised. Finally Albert was forced onto a troop ship and seemed to accept his fate. He looked ESB up when he was in Sling Camp. ESB remarked that Albert seemed resigned. I hope this is of interest and there are more Rose Street human interest sentences that maybe need fitting in with the rest of the information. I was a little surprised to hear from you since I only saw you at Mum’s yesterday, but thanks for sharing these little stories. It’s always great to hear stories of an earlier Waipawa than I know from both you and Mum and I really appreciate it. It’s even better to have stories EVEN further back from Grandad. You and Uncle John had great foresight when you interviewed and taped Grandad and Aunty Nan as some of those anecdotes are wonderful. It sounds like the Donghi’s were interesting, hardworking people and any other stories you have about them or Rose Street I would love to have. As I told you yesterday Rose Street looks like it could be the basis of an historical homes walk for our Waipawa 150th celebrations – starting at the Pines and traveling up. Obviously the story about the Donghi house catching on fire and then blowing up will make an interesting story – even though the original house is no longer there.